Why do finches sometimes toss their chicks or abandon their nest? The most common cause for these behaviors is simple inexperience. Inexperienced Parents: Young finches or older finches that haven't yet raised a clutch are the most likely to toss or abandon their clutch. This may come as a surprise, but not all finches are natural-born parents. These skills take time to develop and with experience these birds learn how to be better parents. First-time parents don't plan to kill their chicks. Instead they panic when the conditions inside the nest change (i.e. eggs hatch). I've watched some first time parents peck at and toss around the newly hatch chicks. They appear to be unsure of what they are supposed to do with the chick but they know something needs to be done. Some peck at the chicks and accidentally kill them, and then toss them or sit on them. Others will throw the chicks from the nest as if they were already dead. Other parents brood their young but never feed them even after several days. Stress: Stress comes in many forms. Rivals for territory, bothersome humans or other pets, even over breeding, all cause stress. Stress is difficult to diagnose and fix because there are so many variables that must be taken into consideration. The easiest way to handle stress issues is to take everything into account and make small adjustments in the areas that seem the most obvious. If your family is always running around the finch cage or playing loud music or games near the finches � move the finches to a less active area of your home. If your finches are laying clutch after clutch and abandoning the nest or the eggs just aren't hatching � remove the nest and give them a break for at least 2 months. If your finches feel open and exposed they may not nest properly � give them privacy. Illness: With all finches illness isn't usually easy to detect. Finches hide weakness very well; it's a survival instinct. 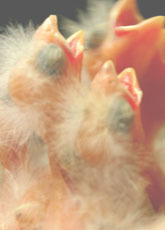 Sick finches will be unable to care for their clutch effectively. They may toss only a few eggs or chicks to unburden themselves of a large family. Or they might abandon the entire clutch and use that time to take care of their own needs. If your finches are sick it's always best to stop the breeding process and care for the adult birds. 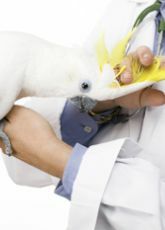 If possible move them to a hospital cage and administer the proper treatment. Problems with the clutch: When problems with the chicks or eggs themselves come up it is rare but it does happen. The most common is Trichomoniasis (canker) which is caused by a protozoal infection passed on from the parents to the young. These Protozoa don't usually harm the parents but quickly kill off the chicks. When Trichomoniasis is detected you must treat the parents before they are allowed to breed again. Other problems aren't as easy to spot. Some are simple birth defects that may or may not have outward signs. Sometimes these unfortunate chicks will be tossed, other times they will be raised until they die of natural causes. When birth defects to occur please check the family history of the parent finches to be sure they aren't related. Inbreding is the number one cause for birth defects. The most obvious sign that the parents are abandoning their chicks is finding the chicks on the cage or aviary floor. The chicks didn't crawl out of the nest so they were either intentionally tossed from the nest or accidentally pushed from the nest. When you find a tossed chick, and it's still alive, warm it in your hands before putting it back in the nest. If the chick was tossed you may find it on the floor again in a few hours. If the chick was pushed from the nest it will probably stay in the nest. Another clear sign the nest has been abandoned is if the parents aren't in the nest and don't go back in to the nest for several hours. It's best not to panic right away if neither parent is in the nest for a short time. If their environment is quite warm they may not need to brood their young as often. However if several hours go by and you are fairly sure the finches have made no attempts to return to the nest, it's time to check the clutch. You can do so by simply putting a finger inside the nest. If the chicks and remaining eggs are cold the touch they have been abandoned. Next you may see the parents dutifully brooding their young but you aren't sure they are feeding their young. This is very hard to spot because if you are always watching the parents you will probably spook them and they won't feed their chicks. The best course of action is to know when the eggs are due to start hatching. Wait 3-4 days after the first egg was to have hatched, then check the nest. If the oldest chick is still alive, it is being fed. If it is dead, then it was not fed. Once you are aware there is a problem your first reaction may be to remove the 1-2 day old chicks from the nest but in the long run this will do more harm than good. One problem with pulling the chicks is most people don't have foster parents willing to take them in. Another problem is that once you've pulled them and don't have any place else to put the, you must then hand feed the chicks and most hand feeding attempts fail. The next problem is one that many people forget. One to two day old finches don't need to be fed. Many finches will feed their chicks a little from the start but most wait until the chick is at least 2 days old. The waiting allows the yolk sac to be fully digested. If the yolk sac isn't digested it can lead to infection and death. The biggest problem with pulling chicks is that the finches haven't been given the chance they need to learn to be good parents to their chicks. If you continually pull chicks they will never learn to raise their own young. Then, if someday you want them to raise their own chicks, the young will probably die while the parents wait for you to remove them. Even if they do lose the first clutch of babies they will have learned something from the experience and should be allowed to try again when they are ready. Never force finches to breed or expect them to breed constantly. When possible, always give the parent finches a chance to raise their chicks. If a chick is tossed and found alive, it is best to put it back in the nest. You may need to put the chick back several times. Often this method works and the parents will stop tossing their young. If they will then care for their young is another issue entirely. When giving the parents a second chance with their tossed clutch isn't possible, have foster parents ready. Finches raised by finches are always better off. Society finches are the most commonly used foster parents. They are highly social and generally willing to feed anything with a beak. If your finches have recently tossed their chicks and you have no societies, now is not the time to buy them and expect them to foster the chicks. 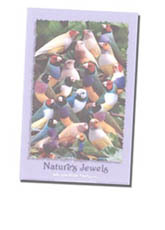 Society finches must have time to acclimate themselves to your home as any new finches would. Then they should be encouraged to build a nest. If they lay eggs and are incubating them, then you can swap their eggs for another finch's eggs or young. If all goes well and the society are indeed ready and willing to be foster parents they will take over rearing the young. The last option is for you to hand feed the chicks. This is not only extremely difficult and time consuming but it's also quite risky for the chick. Humans weren't really meant to raise baby finches and attempting to do so requires a real commitment. 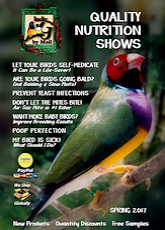 For more information on hand feeding and raising finches please read my book. Always know what to do before attempting to hand raise a chick! Hopefully the parent finches will, in time, learn to rear their own young. You must give them the opportunity to raise their young no matter what the outcome is. Even if they fail several times you must still give them the chance to succeed or they never will.